Cabbage when planted 14 days after tomatoes reduces the incidence of and damage by Diamondback moth (Makumbi, 1996). 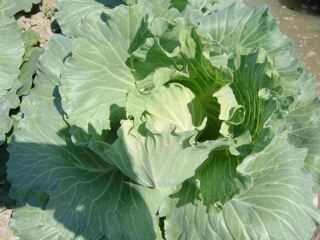 Cabbage intercropped with tomato, coriander or garlic, combined with the application of neem seed kernel extract protects plants from Diamondback moth in the field (Facknath, 1996). Indian mustard (Facknath, 1997), Chinese cabbage, and radish are good trap crops for controlling cabbage webworm, flea hopper, and mustard aphid when planted in every 15 rows of cabbage. The mustard row is either in the outermost or in the middle row to avoid caterpillars being blown by wind into the cabbage plants (Muniappan; Lali, 1997). To control cabbage head caterpillar, Indian mustard should be planted 12 days before transplanting cabbage (Cornell University, 1995). Do not plant cabbage or where members of the cabbage family have been grown for 3 consecutive years to avoid serious problems of pests and diseases. Intercropping with certain combinations will have a beneficial effect on reducing pest damage in crucifer areas. Where farm size is small, seedlings covered with row covers (fine nylon mesh) prevent moths from laying eggs on the leaves and or next to the plant (Agriculture and Agri-Food Canada, 2003). Cabbage needs plenty of nutrients. NPK is needed for head formation. However, excess nitrogen (N) may cause loose head formation and internal decay. Potassium (K) deficiency can result in marginal necrosis and lower head quality, but its excess can cause the heads to open. It has high Sulfur requirement; and is sensitive to Magnesium and Boron deficiency. During land preparation, incorporate10-20 tons of manure/ha with NPK. NPK requirements are 55-75:40-80:80-110 kg/ha on prepared beds of 1-1.2 m width and 30 cm height. The distance between beds should be about 30-40 cm. Two weeks after transplanting another side dressing of 55-75 kg/ha of N should be applied. Alternatively, the same amount can be applied in split dosages as 1-2 % solutions at 3-4 days intervals starting 1-2 weeks after transplanting. Good timing in the split N applications is important for continuous vigorous growth (Siemonsma; Piluek, 1994: pp.130-113; 181-184). However, fertilizer recommendations based on soil analyses offer the very best chances of getting the right amount of fertilizer without over or under fertilizing. Ask for assistance from the local agriculturist office for soil sampling and soil analysis procedures. If you have access to fresh seaweeds, rinse these seaweeds to remove the salt, and then apply them as mulch. Apply œ kg/100 sq feet area. Seaweed is a long-term soil conditioner and growth regulator. It contains micronutrients, amino acid and enzymes plus growth hormones that stimulate plant cell division (Card, et. al., 2002). Card, A.; Whiting, D.; Wilson, C. (2002): Organic fertilizers. Colorado Master Gardener Training. Colorado State University. CMG Fact Sheet #S-34. Makumbi, H. (1996): Ifoam '96 Book of Abstracts. 11th IFOAM Scientific Conference, 11-15 August 1996, Copenhagen, Denmark. Siemonsma, J.; Piluek, K. (2000): Vegetables. Plant resource of Southeast Asia (PROSEA).